What does it take to get a room in Utrecht? When you are an international student, the answer is: Blood, sweat, tears, and a bit of begging. This is the opinion of Johanna Bozuwa, a master's student studying Sustainable Business and Innovation. Before we dive in, I'll introduce myself. My name is Johanna Bozuwa and I am from the United States. You won't guess it from my Dutch (it's sub-par) but I'm also a Dutch citizen. Before moving to NL to study Sustainable Business I lived in NYC and Washington, DC working on climate action. I must admit that finding a room in Utrecht was four fold as hard as in the packed island of Manhattan. Actually, I don't even live in Utrecht it was that challenging to find housing. I live in Amsterdam. But this is not an option for most internationals who don't have access to the free travel provided to Dutch students. Many of my international friends have spent months (one even nine months and four apartments!) moving from temporary room to temporary room, even resorting to blow up matrasses on their friend's floor for weeks at a time. Hours are spent at hospiteeravonden, re-writing your “about you” to show how cool, hip, fun, relaxed, badasss, and chill you are (all at the same time), and poring over Facebook posts and Kamernet. On many postings on Kamernet, it specifies that they are only looking for Dutch roommates. Often on the Utrecht International Students Facebook group you see desperate messages from students at their wits end, unable to secure a spot, "As so many others I am desperate for a room!” or “I’m about to be homeless! If anyone can help me I will reward him/her by cooking very nice Italian dinners for the whole year.” They are going so far as to outbid the asking price of the students because they feel they have no other option. Often, internationals are driven to pay much higher rents. One of my international friends was recently in the very privileged position of having a place her apartment open up. All of a sudden she was in the position of power, and she said she couldn’t believe the onslaught of messages she received for the quaint room where barely a single bed could fit. Within a couple of hours, she had over 170 responses. She said it almost hurt to have to whittle down her list to only fifteen people for the hospiteeravond, rejecting those that she whose struggle she so empathized with. That is not to say that it isn’t hard for Dutch students to find housing in Utrecht. Students coming in from other cities that lack an Utrecht student network have also expressed their frustration with the housing system. There seems to be a shortage of accessible housing as this university city grows and expands. 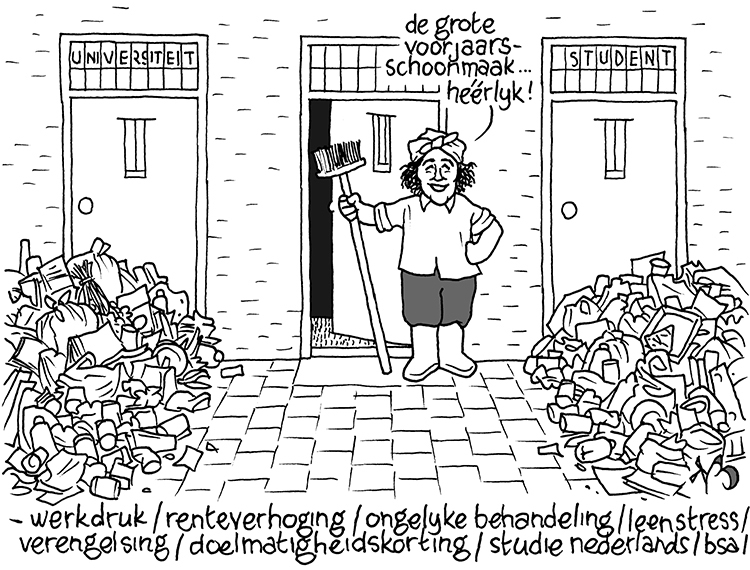 In 2012, RTV Utrecht conducted a study, identifying that there were around 7,000 students lacking housing. DUB followed up last year and found that the city is doing marginally better-down to around 6,000 students. Of all cities in the Netherlands, it has the highest number of students seeking rooms. I’ve polled both my Dutch and international friends to try to comprehend the significant barrier for internationals to find housing. Often they come to the conclusion that, first, they lack a network of Dutch students who have lived in Utrecht for years and can connect them to reliable housing options. Second, often Dutch students are often looking for housemates that have similar cultural touchstones and language. Students make up a significant amount of students in the city — about ten percent. With the UU’s intention to “internationalize” its student body, the city must be prepared to absorb these new students and set up effective structures to provide them with housing, without displacing the Dutch students who also deserve affordable and livable rooms.